You will code, build, and execute two programs requiring arrays and ArrayLists. The first program will determine statistics for a video game tournament. The second program will alphabetize a list of last names. 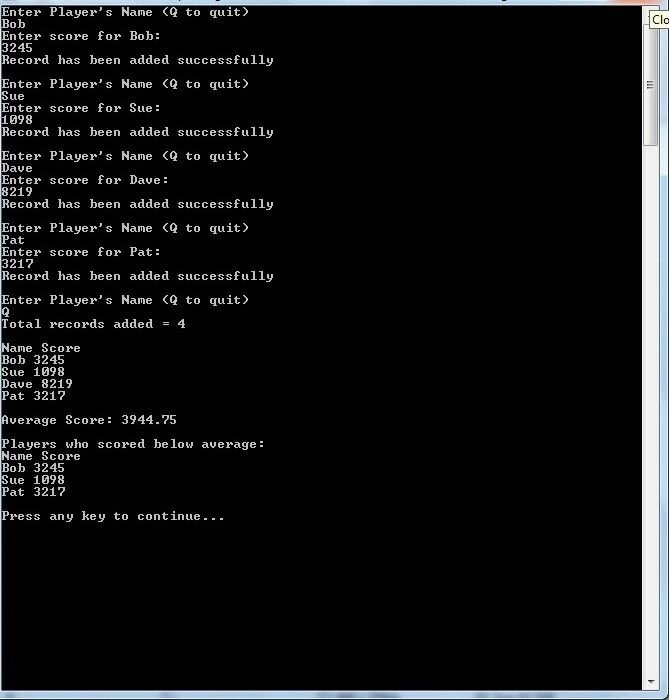 Your mission: Write a program to determine statistics for a video game tournament. The user will input names and scores of all tournament players. The program will calculate the average score and display the players who scored below average. o	InputData( ): Gets player names and scores from the user and stores them into the two arrays for an unknown number of players up to 100.
o	DisplayPlayerData(): Displays each player’s name and score. o	CalculateAverageScore( ): Calculates the average score and returns it by value. o	DisplayBelowAverage( ): Displays the names and scores of players who scored below average. Best practices: Don’t try to write too much at a time! First, write an outline in comments based on the requirements and the pseudocode. Then, implement each function one at a time. Start each by writing a shell that just accepts data and perhaps prints it out for testing purposes. Test by calling the function from Main(). Then, add more functionality. Keep working incrementally, compiling and testing as you go. 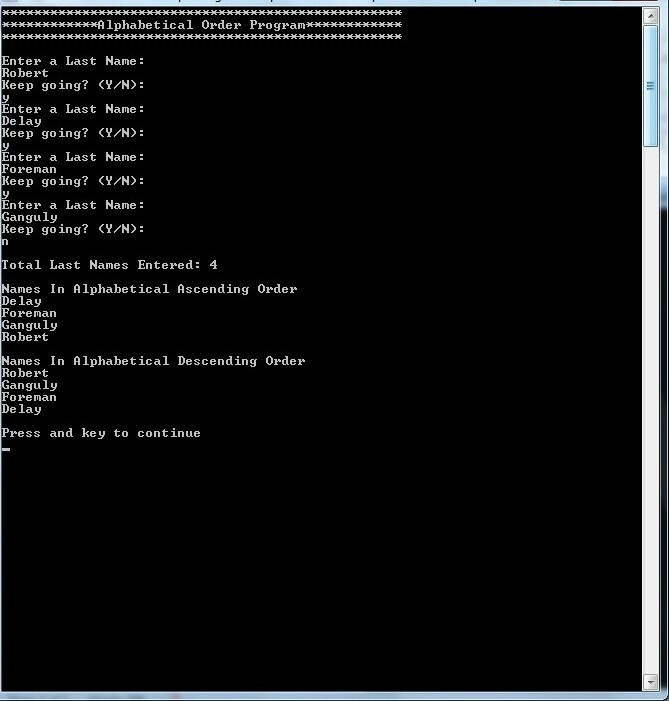 Set breakpoints and use the debugger at each phase to make sure your logic is working correctly. Then, use the same approach to implement each of the other functions. o	Declare player and score arrays, and variables for number of players and average score. o	Call the CalculateAverageScore( ) function, passing arrays and number of players by reference. Store returned value in average variable. Your mission: Write a program to alphabetize a list of last names. The user will input an undetermined number of last names. The program will display the number of names entered and alphabetized lists of the names in ascending (A-Z) and descending (Z-A) order. Your program will store the names in an ArrayList object. It will use various ArrayList properties and methods to implement the program requirements. Best practices: Don’t try to write too much at a time! 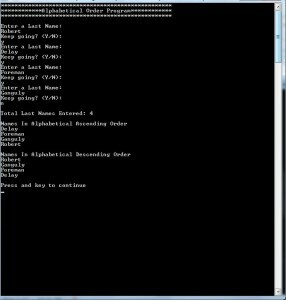 First, write an outline in comments based on the requirements and the pseudocode. Then, work on instantiating an ArrayList object, followed by implementing the loop that will get user input. As always, keep things simple and implement incrementally. Review the list of ArrayList methods and properties in the textbook and experiment with the ones you think you’ll need.